CSS (Cascading Style Sheets) are coded files that select elements of your page and control their presentation. Think of your custom template's HTML as the bones of your website and the CSS as the skin of your site. 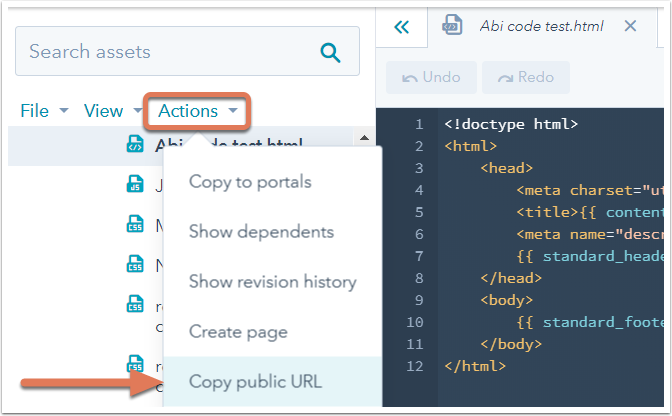 This article walks through creating, publishing, and attaching a CSS file in HubSpot. You can learn how to make simple design changes to a particular page here. Please note: if you were migrated to HubSpot by HubSpot's Technical Services team, you'll already have some default CSS files created for you. If needed, work with your designer to modify these files to adjust the look of your site. Click the folder icon folder in the upper left-hand corner to expand the sidebar menu. Then click File > New file. Once you have created or opened an existing CSS file, make your edits in the code editor. 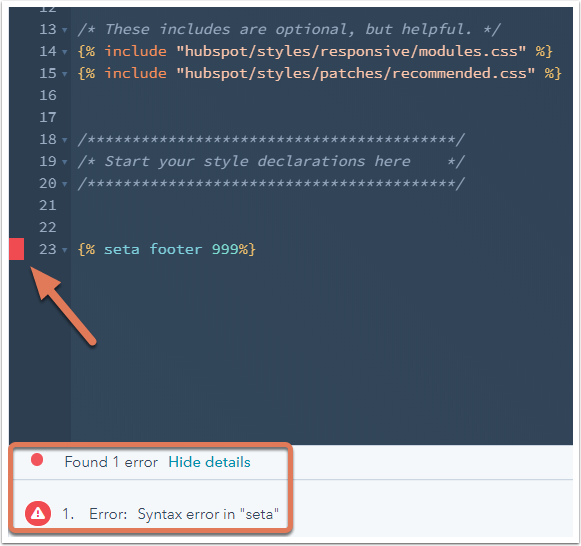 In addition to standard CSS, the code editor supports HubL variables and macros to make maintaining your CSS easier. To see a list of standard CSS selectors for HubSpot templates, check out Boilerplate CSS. In the error console along the bottom of the code editor. In the error gutter along the left-hand side of the code editor. In the scroll bar on the right-hand side of the editor. Errors preventing you from publishing will be in red, while general warnings will be in yellow. At the bottom of the code editor, click Show details to see more information on the errors in the error console and Hide details to collapse the error console. In the error console, there will be links to wherever there are HubL errors or warnings in your code or custom module. Hover over the red error indicators on the left-hand side of the code editor to see the error or warning in your code. Clicking the error will cycle your cursor to all errors or warnings on that line. Clicking a scrollbar annotation will bring you to that part of the file. You can also click a line number within the code editor and have the URL of the file update accordingly. This allows you to share a link to your code with others and direct them to exactly where you're working within the file. After editing the file, click Publish changes in the upper right-hand corner. If you'd like to call in this stylesheet in another coded template, copy the sheet's URL by clicking Actions > Copy public URL in the left sidebar menu. public_common.css * - a stylesheet primarily used by HubSpot's app, but also for certain site features. Header HTML in settings under Website > Pages - link tags added to the global <head> of the site. Layout.css ** - default responsive CSS file attached to all drag-and-drop template layouts. Attached stylesheets in settings under Website > Pages - stylesheets attached to your entire site. Attached stylesheets in settings under Website > Blog - stylesheets attached to your blog (overrides site global sheets). Linked stylesheets*** - stylesheets attached in the template layout. Additional <head> markup in the template - link tags added to the <head> of a particular template layout. Page-specific stylesheets - stylesheets attached in a page's settings. Page head HTML - link tags added to the <head> of a particular page in the page's settings. To attach stylesheets to a template, open the template in your design manager. 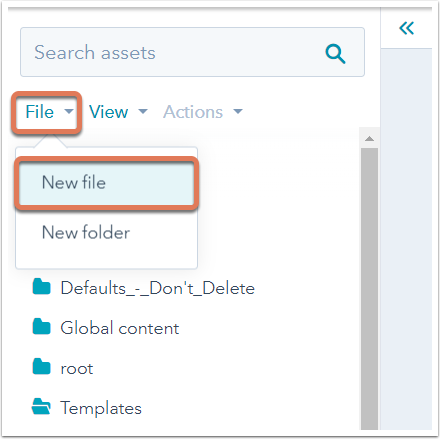 In the right sidebar menu under Head and Body Options, select a file from the Add dropdown menu beside Linked stylesheets. You can edit or remove a stylesheet that's already attached by hovering over it and clicking Edit to make changes to it or the X to remove it. 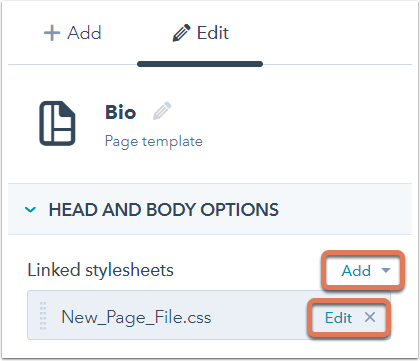 After adding a stylesheet, click Publish changes in the upper right-hand corner to apply your changes to the live pages(s) using the template. Navigate to website pages or landing pages. Hover over your page and click Edit. In the page editor, click Settings at the top. Scroll down and click Advanced Options. Under Page Stylesheets, click the Attach a stylesheet dropdown menu and select the sheet you'd like to attach. Click the X next to the stylesheet you'd like to remove. Click Save and Publish in the upper right-hand corner. Under the same Settings tab in the page editor, select Disabled from the dropdown menu next to your included stylesheets. In the sidebar menu, click Website > Pages. On theTemplates tab, scroll to CSS & Stylesheets. To add a stylesheet, click + Add style sheet. Click the X beside an attached stylesheet to remove it.